Introducing a dog to resident cats is a little different. Bring the dog in on leash and watch the cats' reactions to the dog, and vice versa. If the cats don't feel threatened or appear defensive, and the dog isn't straining on the leash to get to the cats, it will probably work out. In my experience, puppies always chase cats. It is a puppy thing. Yes, they can be stopped and disciplined, but it usually takes a while for it to sink in. If they catch the kitty, they usually don't do damage unless the cats hurts them. Then all bets are off. Most dogs will be interested in the cats, but not go into the predatory mode…ears forward, tail curled up tight, head, shoulders, back in a straight line, stalking. If they show this type of behavior, it may not work, or the cats and dogs will have to be kept separate. Now it has been established that the dog is not predatory, and the cats feel okay around him, introductions begin. I crate the dog when I am not home, and when I am home, keep the dog on a leash that is attached to my waist. This allows some reaction time, and limits how far he can go if he decides to chase kitties. Another method is to put up a cheap wooden screen door in front of one room, leaving the regular door open. This arrangement allows the dog and cats to sniff and see each other, but with a safety barrier. Make sure the regular door is closed and keep them separate when unsupervised or if no one is home. Keep a very close watch on them until it is obvious they are comfortable together. Introducing kittens requires a totally different technique. Kittens are very small and with their quick movements, VERY reminiscent of prey. 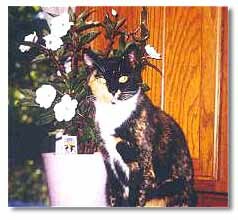 They cannot climb, claw or escape from the dogs as quickly an adult cat can because they are young and not fully developed. When bringing in a kitten, I put her in a separate room initially. Once she becomes acclimated to the environment and learns to trust me, I hold the kitten and let the dog sniff at her. 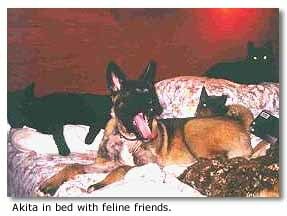 If I have a very nice, calm dog whom I know likes cats, I will let him lay on the bed, with the kitten loose, giving the kitten time to approach the dog at her own pace. When the kitten reaches four months, I will put her in a crate, with a litter box, food and a towel. The crate is in a high traffic area, so the kitten can become accustomed to the sounds, smells and sights of the house. (I recommend a 700 Vari-kennel type crate…kittens can slip through the wire ones.) It is better to do this, under supervision so the dog(s) cannot terrorize the kitten by pawing at the crate and moving it around. If on one is home to monitor the animals, keep the kitten in a separate room. I do not feel comfortable letting the kitten run loose in the house until they are at least 8 months-1 year and able to escape or defend themselves if necessary. Dynamics can change. A young dog may fit in well initially, but as he gets older may want to challenge the other dog for top position. If he continues fighting and challenging, they may have to be kept separate for life. You can have two dogs live together in harmony for years. They both have a bad day, and a fight ensues. If it is a bad one with serious injuries, or you have a dog that bears a grudge, they may never live in harmony again. An older dog can become blind, or have painful joint problems and no longer want to rough house. They may react accordingly when a young dog does not take the hint and leave them alone, starting a fight that the older dog is likely to lose. The best tools for success are being able to read your dog's body language and your knowledge of your dog's personality. Dogs, like people, have their individual quirks. Sometimes two dogs will just have a personality conflict and will not be able to get along. In this case, keep them separate forever, or re-home one dog. The steps I have outlined are time consuming and quite often troublesome. But a good introduction sets the stage for the future relationship. Bad beginnings can make enemies for life. The time and effort to start things off right are well rewarded when you have two dogs, or a dog and a cat, living together happily and peacefully. A final note of caution: If you leave dogs, or dogs and cats home alone together, there is a very real possibility that you may come home to serious injuries, or the death of one of the animals. The author currently has 15 Akitas, 12 of which run together and live with 20 cats. However, when she is not home, certain dogs are kept separate from others.